Apple's assertion that the "death grip" issue is a problem on all smartphones, not just the iPhone 4. 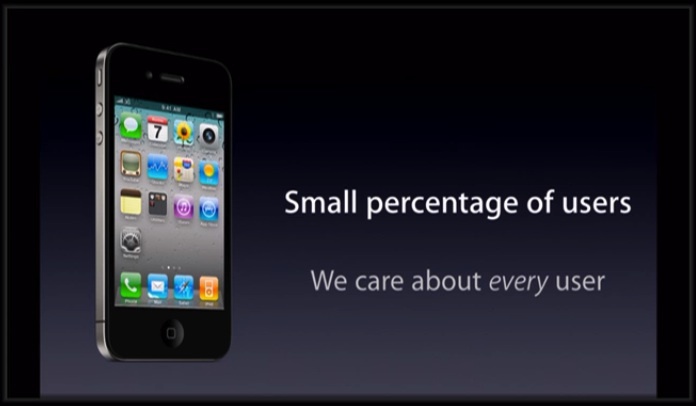 Mr. Jobs suggests that the loss of signal, or "bars", was more noticeable because of the two slits on the lower left and right sides of the iPhone 4. 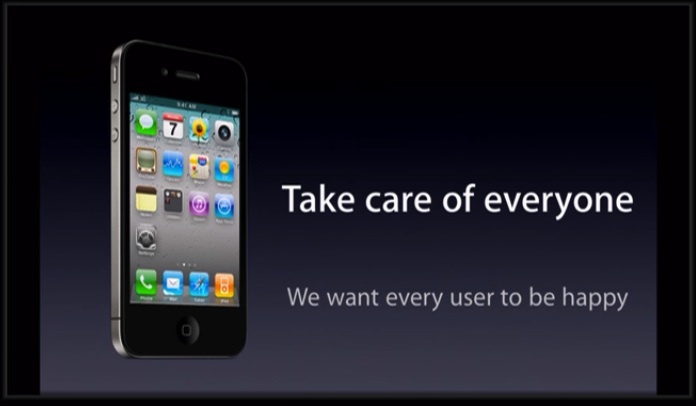 Mr. Jobs also said that Apple takes these issues seriously and that they, "care about every user," and that they "love our users." 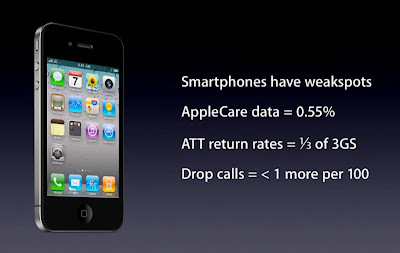 During the presentation, Apple uncharacteristically came clean with some hard numbers based on the data that they have. 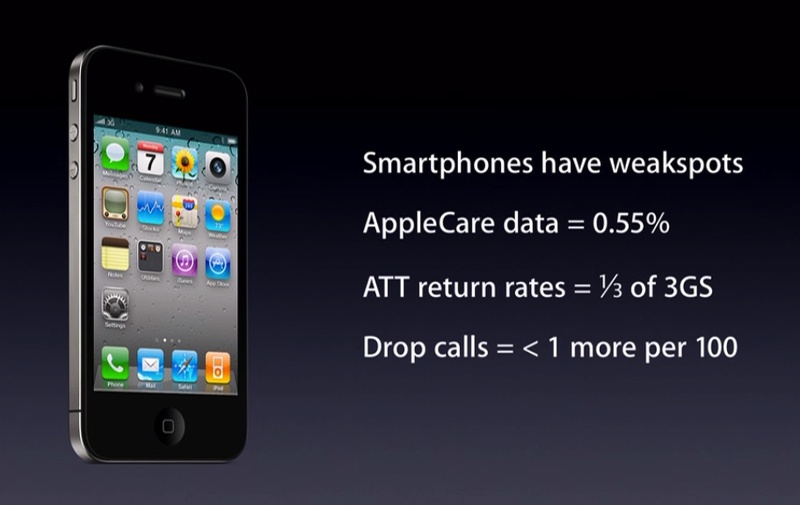 Apple also released the delta change between early iPhone 3GS and iPhone 4 dropped call statistics per 100 calls. To help address the issue of signal strength, Apple also released the iOS 4.0.1 update on July 15th. The update is free to all iPhone OS 4 users and anyone using an iPhone 3 or iPhone 3GS. 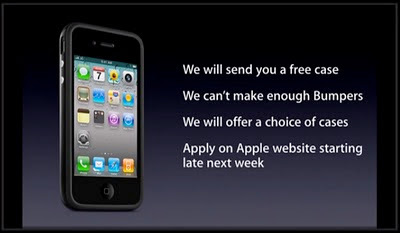 The iOS 4.0 software will not run on the original iPhone, also known as the iPhone 2G. The software update is available for download via iTunes on your Mac or Windows PC. Even though Mr. Jobs' assertion is that this is not the major customer problem that some technology blogs are making it out to be, Apple wants to "take care of everyone" by giving all iPhone 4 customers a free case. 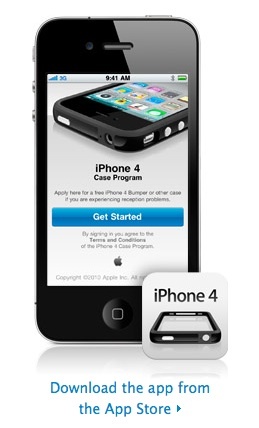 If they have already purchased an Apple iPhone 4 bumper case, the company will automatically refund your money. If you still don't like the iPhone 4 or feel that the antenna issue is a big problem for you, you can bring the phone back to an Apple or AT&T store for a full refund. No restocking fees. A full refund. No questions asked. The iPhone must be in good working condition and you have 30 days to return the phone from the day if shipped from Apple or you purchased it from an AT&T store. 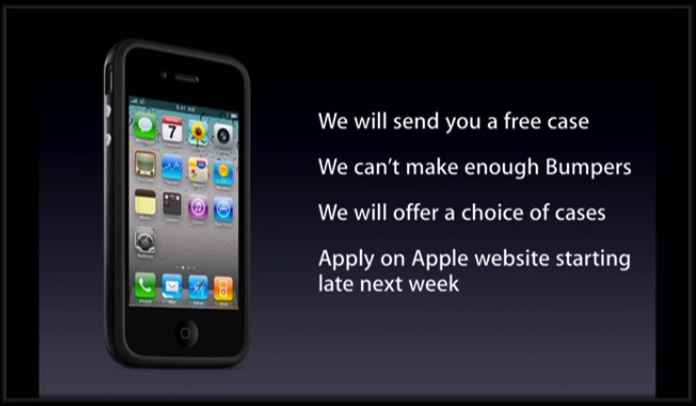 I'm glad to see Apple stepping up to the plate to offer free cases to every iPhone 4 owner and anyone who purchases an iPhone 4 until September 30th. My personal feeling is that yes there is a problem, but it isn't as big as you may be lead to believe by the media. For me, I'm satisfied with the outcome, but then again I don't own an iPhone 4. I plan on waiting until I can get one on the Sprint network.